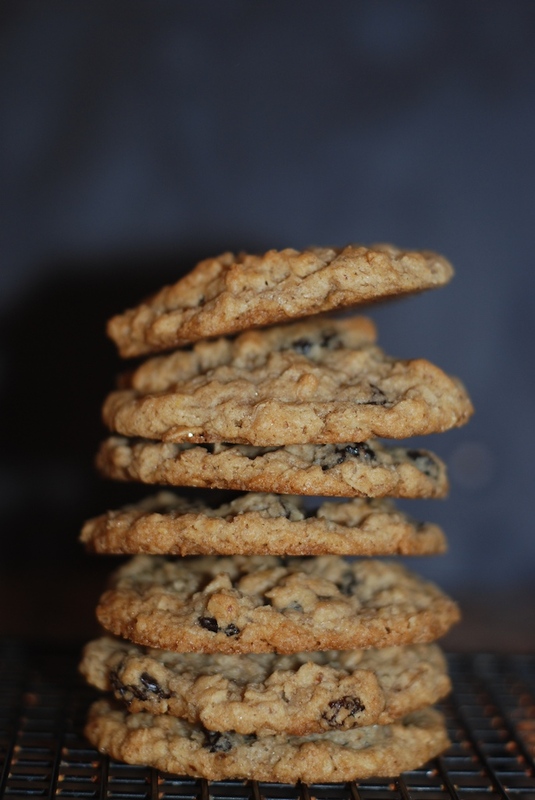 Oatmeal raisin cookies are a favorite in our household. The standard recipe holds up well to experimentation. The trick is making certain there is enough “glue” in your ingredient mixture to hold the cookie together. Here, ground flax seed takes the place of two large eggs. If you don’t have flax on hand (or maybe you don’t enjoy it as much as I do) use the eggs instead. The same is true in this recipe for wheat flour vs. gluten-free pancake mix. If you don’t care one way or the other about vegan or gluten-free, scroll straight to the recipe. While my fascination with flax began because my sister in law is vegan, my inclusion of gluten-free (GF) baking options stems from my body’s inability to process gluten without undue distress. In fact, my whole household is gluten-free–not a health fad diet choice, but because gluten wreaks havoc with our brain and digestive function. When gluten went away, so did our consumption of most sweet treats and baked goods. Textures and flavor are not carried the same way on GF ingredients. But life without cookies is intolerable, so we persisted in our search for the best GF baking alternatives. It took about three years to discover that the best gluten-free flour is actually what you would find in a GF pancake mix. In most recipes, baking powder and baking soda are omitted when an all-purpose mix is used. However, oatmeal is the main flour ingredient in this recipe, so baking powder remains. Preheat oven to 375 and grease your cookie sheet(s). Beat all ingredients except oats, flour and raisins in large bowl at medium speed or by hand. Stir in remaining ingredients. Drop about 2 tbsp dough on cookie sheet 2 inches apart. Bake 10-15 minutes until top darkens. Serve warm with a cup of Storyteller’s Chai.